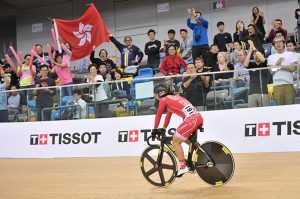 Second day event of the UCI Track Cycling World Cup-Hong Kong, co-organized by the Union Cycliste Internationale (UCI) and The Cycling Association of Hong Kong, China Limited (CAHK), concluded today in the Hong Kong Velodrome. Hong Kong cycling icon Sarah Lee Wai-sze delivered outstanding performance to claim Women’s Sprint silver medal. Sarah Lee Wai-sze delivers outstanding performance to claim Women’s Sprint silver medal. Buchli Matthijs (NED) snatches the gold medal in the Men’s Keirin. 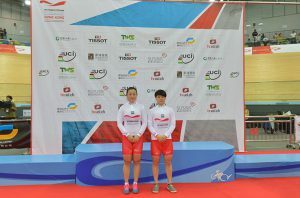 China’s duo Guo Shuang/Lin Junhong totaled 390 points to notch the Women’s Team Sprint World Cup title. Enthusiastic fans cheer for Hong Kong rider Sarah Lee Wai-sze.